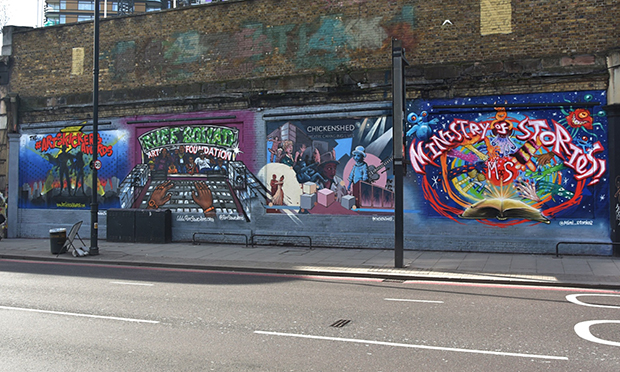 Mayor of Hackney Philip Glanville today lifted the curtain on a reimagined Shoreditch Art Wall – after the consortium behind a new £750 million development announced it will preserve the well-known mural space as a platform for artists and charities. The 60 square metres of Victorian brickwork on Great Eastern Street has become an iconic spot for street art, but has also been used for advertising. The future of the wall had been in question as it backs on to a huge mixed-use development called The Stage, which is expected to be completed in 2020. But Cain International, the consortium of investors behind the development, has announced it will preserve the bricks as a canvas for collaborations between artists and Hackney-based charities, with plans to showcase new work every three months. The artwork revealed today features four local organisations – Artskickers, Chicken Shed, Ministry of Stories and Ruff Sqwad Foundation. Mayor Glanville said: “The Shoreditch Art Wall allows us to capture a key part of Shoreditch’s history and I am delighted to see the art wall is being used creatively and for such a great cause. Work on The Stage started last year, and the end result will feature 400 homes, 200,000 square feet of office space, restaurants and cafés, and even a new park. The site hit headlines in 2012 when archaeologists found the remains of a Shakespearean theatre. Findings from a follow-up dig were revealed in 2016. CI says the theatre’s remains will be protected in situ to form part of an international visitor centre. The consortium’s principal, Robert Allan, said: “We are committed to preserving the history of Shoreditch and the remains of Shakespeare’s Curtain Theatre at The Stage. “The art wall will not only be a blank canvas for local charities but a powerful reminder of Shoreditch’s heritage, diversity and its flourishing arts scene.